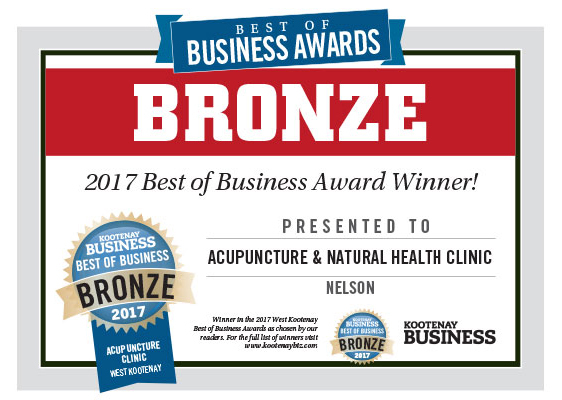 The Acupuncture & Natural Health Clinic in Nelson, BC has been providing acupuncture and Chinese Medicine since 2001. Offering Acupuncture, Massage Therapy, Chinese Herbal Medicine, Cupping and Sports Medicine. We treat a broad range of chronic pain, injuries and illnesses. Shauna Robertson, R.TCM.P. If you have extended health coverage you may have part or all of your treatment paid for by your insurance company. Can the clinic direct bill my insurance company? *Please bring your insurance card with you if you'd like us to direct bill. **Some insurance companies require a M.D referral/prescription for treatments. Please check with your insurance company if you need one. How should I prepare for my initial visit? Please arrive a few minutes early in order to fill out some forms. What to expect at my initial visit? Your practitioner will ask you questions regarding your health history and your current health concerns. From there you and your practitioner will discuss what the best course of treatment. Treatment frequency depends on a variety of factors: the severity and duration of the problem . Your practitioner may suggest one or two treatments per week, or monthly visits for maintaining your health. Can children receive Acupuncture & Massage Therapy? Yes! Both Acupuncture & Massage Therapy can benefit children. If your child has a fear of needles then your acupuncturist will use acupressure instead of needles. Is Acupuncture & Massage Therapy safe in Pregnancy? Yes! Both Acupuncture & Massage Therapy are safe in pregnancy. Many pregnancy related conditions can be relieved with the help of Acupuncture & Massage Therapy. Acupuncture uses very fine needles and generally isn't painful. You may feel an electric sensation or a feeling of muscle contraction. This is all normal and if at any time during the treatment you experience pain that doesn't subside you should let your practitioner know so they can remove or adjust the needles. Your comfort is very important! Acupuncturists and Chinese Medicine Practitioners in BC undertake three to five years of extensive and comprehensive graduate training. All acupuncturists must pass a provincial exams and meet strict guidelines to practice in British Columbia. As well as carry on continuous education on a yearly basis. BC Registered massage therapists graduate from a rigorous 2200 hour program that includes science, practical and professional components. Each RMT must pass a board exam and continue their education to maintain registration with the college of massage therapists of British Columbia.